As the Emulsion Size app pointed out, most of the energy in emulsification is lost as heat. We have a complex, turbulent process and it is very hard to predict what drop size should be produced. This expert-level app choses one approach which is a reasonable balance between sophistication and practicality. It would be wonderful to have a single equation that predicted how the drop size in an emulsion depended on the key input parameters. A Davies variant of the Hinze-Kolmogorov equation that incorporates the effects of the viscosity of the disperse phase, ηD. An equation that defines a transitional volume fraction, φTR, above which a very different behaviour is observed. The rather simple equation describing drop size at high(er) volume fractions above φTR. The Yaron, Gal-Or equation describing the viscosity of the continuous phase, ηC in terms of φ. One of the key issues with Hinze-Kolmogorov equations is that they are defined in terms of the energy dissipation per unit volume, ε, which depends on the specific disperser. This can be calculated from rotation speed, R and rotor diameter D via ε=b1(rpm)3D2. It is the formulator's job to estimate b1 for their own system. In addition the variant of Hinze-Kolmogorov used here has two further parameters, A1 and A2. The default values are a reasonable match to those in the original paper (which used two different homogenizers); you will have to find your own via fitting to a few representitive cases. For those who are observant, the first equation is transcendental, it has the desired value, d, on both sides of the equation. The φTR equation is equally transcendentally inconvenient. That is why one has apps. To avoid a sharp and unrealistic jump between the two modes at φTR a transition zone is included using a weighted average. This is a purely cosmetic addition and is not part of the paper. The equations represent the summary of a lot of work by the Tcholakova team. The use of the Davies version of Hinze-Kolmogorov required a lot of experimental validation to distinguish it from alternatives. When drop viscosities and φ are low the equation becomes equivalent to simpler Hinze-Kolmogorov versions. The calculation of φTR is connected to the change between inertial break-up of drops, which is the mode at lower viscosities and φ, to a viscous break-up regime. The difference is that in the inertial case the drops are larger than the turbulent eddies and deform from the "outside" pressures from the flow, while in the viscous domain the drops are smaller than the eddies and deform by viscous dissipation from inside and between the eddies. Although the idea of φTR has been around for a long time (connected to the Kolmogorov scale, λ), it needed the combination of a number of factors, including the Yaron, Gal-Or viscosity term before the team could match the transition to their experimental data. The equation above φTR is an excellent fit to their data - and nothing more. Elegant alternative methodologies were tested but they showed no match to the experimental data and no justification for (or alternative to) the fitted formula has yet been found. 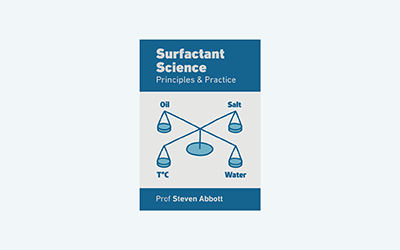 One striking outcome of the theory is that it shows how and why some relatively useless surfactants in terms of interfacial energy can give emulsions just as good as those which produce lower interfacial energies - something which goes against years of intuition. It is all about the balance of viscosities, φ and interfacial energy, and sometimes the latter factor is of no importance. It is incredibly important to know this. Some "bad" surfactants, such as many food surfactants, give high interfacial tensions while also (e.g. because they are large proteins) providing robust defence against coalescence or ripening. The lack of need for low interfacial tension is especially clear in the regime above φTR which is why, perhaps, so many food emulsions with high concentrations of fats and oils are stable. At present this set of equations is the best available for describing the whole range of emulsification possibilities with just a few adjustable constants which can be determined experimentally with relatively little effort.